This is a topic for anyone that's a fan of the band twenty øne piløts. Discuss your favorite songs, or anything of the like! I found the band after my sister bought some of their dvds. They soon came to be one of my favorite bands afterward. My favorite songs from them are The Judge, HeavyDirtySoul, We Don't Believe What's On TV, and House of Gold. This is a great band. I recently bought their last album, Blurryface. My favorite song off of it is Ride. Since Suicide Squad, everyone knows about these guys, so I won't be surprised if this topic fills up immensely. Yeah I bought their Heathens single a few days ago. I like a few of them, but I'm not too fond of others. I haven't heard all their songs though. They're great musicians though. Looking forward to see them make more radio hits. I started listening to them since I got back. I imagine they're pretty overrated but I enjoy them for the most part. Definitely unique. Are there any other TOP fans on the Boards who want to come out of the woodwork? I'm excited to "come out of the woodwork", that's for sure. My younger sister is a crazy fan of this band, and as much as I disliked admitting it at first, I'm thrilled in every way by their songs. "Goner" and "We Don't Believe What's On TV" stand as my favorites at the moment. By the way, I probably heard Heathens thirty times before I caught who the artist was. Whoa. In the sense of musical composition, it was quite a departure, but it definitely stays to the iconic theme that they've set throughout their albums otherwise. "We Don't Believe What's On TV"
Though I've already stated my love for this band, I'd like to point out the funny fact that several people on here got into this band with or because of their sister. My sister was an avid fan and introduced me to TOP as well. Might I ask why you didn't want to admit it? Oh gosh, that song is heart-wrenching. I love the layered, meaningful lyrics. That song is actually one of the few on Blurryface that I don't actively go back to. I guess I just need to listen to it a few more times. I don't think they really have a style to depart from. Haven't really listened to them in a while but I like Hometown a lot now. Well, when I first heard of them a year or so ago, I was hearing a ton about them from people who were my sister's age. (As well as my mom, lol.) 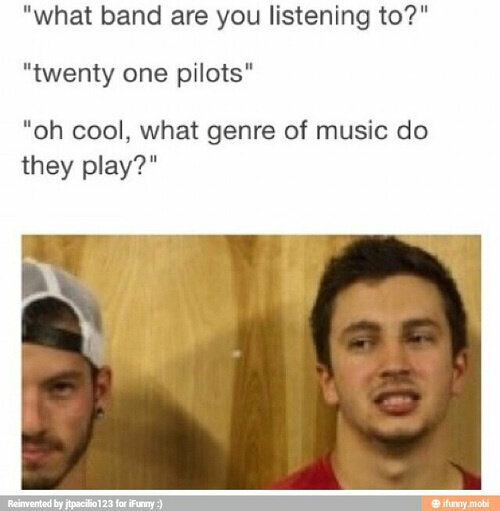 I brought up the idea of the band to some of my friends, and Blurryface didn't really interest them. Since Suicide Squad, I'm suddenly not the only senior at my school listening to them. Strange, right? IMO pretty much everything that they've done is extraordinary. Oh, I'm pretty sure that they do. Heathens kind of sounds like any old pop song at first listen; still unique and much better, but pretty similar. The lyrics, though are what makes it. Heavy, dirty, lyrics are really what makes the band. Since Suicide Squad, I'm suddenly not the only senior at my school listening to them. Strange, right? That's interesting in the sense that I heard a lot about them from people I came across as a missionary before Heathens even came out. Even after the movie came out I still didn't hear that much about it. TOP is one of those perfect bands that have the crazy kind of lyrics that are worth graffitiing all over something. Think about a huge wall mural with some lyrics from "Guns For Hands" on it. I heard stressed out in 2016 and I loved it. My favourite songs are, heavydirtysoul, semi automatic, polarize, guns for hands, stressed out and, fake you out.